I saw this quote while scrolling through Facebook and it just made me smile. 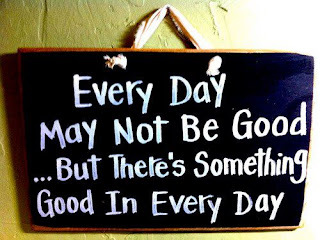 I decided to post this on my blog so every time one of my readers (or myself) start to feel like the day just isn't going right, we can pull this post back up and be reminded that there is at least one thing in everyday that is positive. It might be something small, something you might not even realize on any other day. 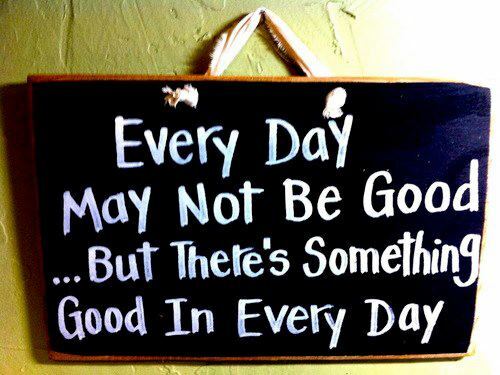 Something that on a good day might not even cross your mind on a day that is considered good. This quote really reminds me and I hope it does so for my readers as well, that its important to remember to stop and appreciate the good things in your life. Or as my grandma says, "Count your blessings." Yes you may have an off day, but that doesn't mean your life is coming to an end. Every day may not be good but that doesn't mean there isn't hope or the chance for something positively to come out of that day. Was there ever a time in your life where you thought things just weren't going your way? Was there ever a time when things weren't so good but once you started to count all the good things in your life, you started to feel better about your day and maybe even yourself? When there comes a time when things aren't so good, I encourage you to stop, look around and find something positive in the negativity that surrounds you. Once you start to find the positives, its hard not to notice them and its even harder to stop counting them.